It appears to be a real winner for free online contact form! First, REALLY like the product. As a Beta product, I was VERY surprised to see there was nowhere or direction for entering bugs and other such problems/comments about the product. So, I am sending them here. 1.On the Form - in the default size when opened, the rollover caption text from the Save HTML button "Save as HTML file" does not fully display. 2.The default directory for all Save functions is the Program Files directory which is protected space so the program will not save any forms. 3.The Save as HTML button does not function AT ALL so no way to use the product or test for real on web. 4.Since no functional save, the My Forms button works until you close the product and then when you reopen, the list is empty no matter how much work you put in (thus, I am limiting testing for now to prevent wasting my time). 5.Proper save of "My account" by program (odd, see 2-4) but worded oddly and not clear in the help such that you know this is the 'Message' output location until you try. 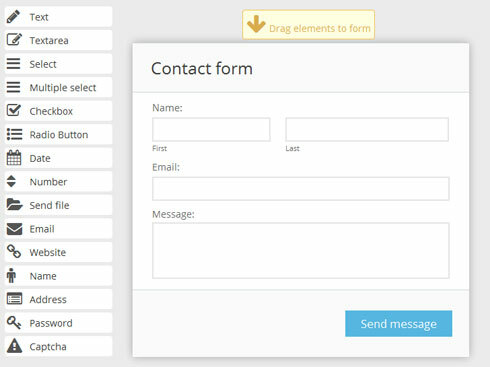 6.The 'Drag Elements to Form' sporadically appear and disappear when using free online contact form Elements. 7.Elements aren't dragged as prompted in #6 but just appear on Form in order of click when clicked on so you need to reorder by dragging after adding to Form. 8.Elements are vertically linear without apparent option of having Elements side by side (example two columns of radio buttons next to each other (but has not been fully tested yet to confirm - see 2-4). 9.Redirect only seen to work to an http:// location instead of to another page in the same website (ex. ../info/Locations.html) but cannot be tested due to lack of Save ability (see 2-4). 10.Just wondering why Email and Website are called out as simple combo of Text and Textarea for the namesakes but no other such combos exist (Name, Address, etc.) and wonder if they have special functionality not called out. 11.Help file is really quite poor. Would be happy to work with you to construct/write a real help file for the free online contact form product (like I said, I REALLY like this product!!!). 12.A comment, not a bug as such, but how is Captcha confirmed or function? It shows the same directional as the Submit button but also has Private and Public key input options. Not sure how that is expected to function toward prompting someone to confirm a Captcha and then allow them to move on or send them a "wrong Captcha" prompt and retry. That's enough for tonight. More to come once I hear back from you. Thanks again for such a great product and a chance to test it. By the way, it is in Beta but already at v1.6? Were there any real previous versions I could see?